Carlaya the Queen Of Flow is one of Las Vegas’ hottest female media personalities. She’s a winner of the 2012 Las Vegas Review Journal’s Best Radio Personality Award and the class of 2013 Nevada Broadcasters Hall of Fame. 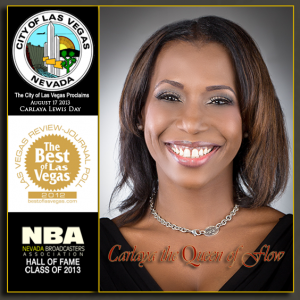 She has been honored with the City of Las Vegas proclaimation of declaring August 17th 2013, “Carlaya Lewis Day”. She is a 22 year on-air veteran and has mantained her own online radio site for over five years. As an entertainment journalist has interviewed artists as diverse as Roger Troutman, Rick James, the Whispers, The Brothers Johnson, Tevin Campbell, Avant, 702, Anthony Hamilton, Kashif, The Jazz Crusaders, Lala Hathaway, Musiq Soulchild, Teena Marie, Charlie Wilson, Eddie Levert, Switch, Chaka Khan, Chris Tucker, Quincy Jones, Michael Caine, Mike Epps, Tracy Morgan, Al Jarreau and many more. She was born and raised in Compton L.A. California and is a child of the turbulent seventies and eighties. She majored in fine arts and dance at UCLA and began her radio career with Kaleidoscope Radio Magazine in Hollywood, California producing her own show entitled “New Talent Showcase” introducing talented aspiring artists with radio quality demos to the L.A. audience. She started her Las Vegas radio internship with KCEP 88.1, Las Vegas. For over 11 years her original Sunday Night Slow Jams radio show was one of the highest rated Sunday night radio shows in Las Vegas and she’s now poised to set the internet on fire with her new slow jam radio and video show, “Turn Off The Lights”. With that along with hosting live events across Las Vegas, Carlaya the Queen Of Flow has become a strong brand in a radio market with over 2 million listeners and millions of tourists. Her style is larger than life, energetic, playfully provactive and seductive.